Could NFL Defenses Handle All The Pre-Snap Motions and Fakes? When I started coaching back in 1993, we ran the Wing-T offense, with the classic buck sweep (244, 123), FB gut/trap/bend (130, 239), and waggle pass all there. It was learned by Ricky Rodriguez (not the Coach Rod we all know from West Virginia fame... this was a coach who actually coached me in high school and played football at Northern Arizona - Herb Hand has a funny story about a time at a coaches seminar that both "Coach Rodriguez's" attended and a call from Nebraska I believe came in and the hotel staff directed the call to the wrong Rodriguez) who learned it from Chuck Johnson, a great HS coach in the state of NJ. All the faking, all the pre-snap motion by the wing backs, the QB carrying out all his fake progressions on the buck sweep ... it was extremely difficult on a defense, a high school defense. Last year I remember watching a Miami Dolphins game and Phil Simms was calling the game. Simms has attended many New Jersey high school football games, with his sons Chris and Matt playing at two of the best programs in the state. Simms made a comment that stuck with me: "The Miami Dolphins offense with all the pre-snap motion, wing back sets, wildcat, and hand-off fakes makes me feel like I'm watching a high school football game." Simms was not being derogatory in his comments, because the Miami offense was moving down the field, picking up chunks of yardage both on the ground and in the air. I was thinking the same thing... and the defense, unlike many NFL defenses that love flying 'down hill' to blow up power plays, ISO's, and inside/outside zone plays was flat footed. Now Miami wasn't running the Wing-T offense, but the simple execution of carrying out good fakes by the QB and RB's and the pre-snap movement of the 'wing backs' (which in the NFL is now the H-back... excuse me) was tough on the defense. It made them less likely to fly down-hill or hesitant on their reads, which is good news to any offense. Oh, and this wasn't even the wildcat formation, this was Chad Pennington under center, who to me is an excellent technician at QB, whatever you ask him to do. I posted a couple of weeks ago a video showing Miami seriously gashing Seattle last year out of the triple option spread set. 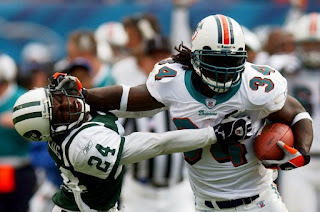 Look at the video again (click above)... and keep an eye on the Seattle strong safety (it's a quick blurr... but you'll see him) fly out to the perimeter and literally run right past Ricky Williams who had the ball on the inside zone. Do you think that strong safety was faked out? Possibly told during the preparation week to 'watch the jet sweep out of the wildcat to the perimeter'. It actually reminded me of what I used to see in film sessions coaching high school football against good wing-t teams. One thing is for sure... easy touchdowns in the NFL are hard to come by, especially in the ground game. Imagine if running the ball becomes easier? How much more will that open up the passing game?... the true jet fuel of NFL offenses. Just something to ponder, and something we may see more of on Sundays. Will The NFL QB Protection Rules Help Pat White Run The Zone Read? Let me lay out a scenario that we may see this upcoming NFL football season, and you tell me what the Referee will do, who's responsibility it is to 'protect the quarterback' in the NFL from unnecessary hits. It's November 19th and the Miami Dolphins are playing the Carolina Panthers on the NFL Network. Pat White is in at QB for Miami, with Ronnie Brown and Ricky Williams joining him in the classic 2 back (3, including White) shot gun spread option set. The ball is snapped, and White, Williams, and Brown begin running a classic triple option play out of the shot gun. 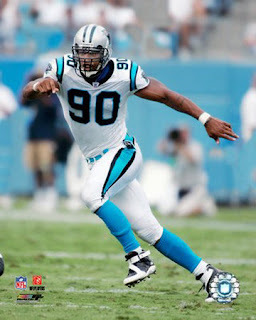 White 'zone reads' the initial inside zone hand-off to Williams, decides to pull the ball as the backside defensive end (Julius Peppers -- yikes!) executes a perfect 'square shoulder' anchor technique in the murky B-C gap area on the LOS. White... who can run this play in his sleep with all the reps he's had over the past 5 years now attacks the perimeter as his instincts tell him with Ronnie Brown in a perfect pitch relationship, 4x4 (four yards deeper than the quarterback and four yards in front of him). Peppers, who's instincts like White's are well situated in his DNA to attack QB's decides to coil and fire like a Cobra snake in a static stance at White... landing his face mask into White's chest/lower face mask area. White gets the pitch off perfectly to Brown who gets the edge and registers a nice 10 yard gain. Does the referee ever call a flag on this hit? Is there factors in the hit that would make the referee call or not call this 'roughing the quarterback'?? Would love to hear comments on this... knowing how the NFL is proactive in protecting their quarterbacks.